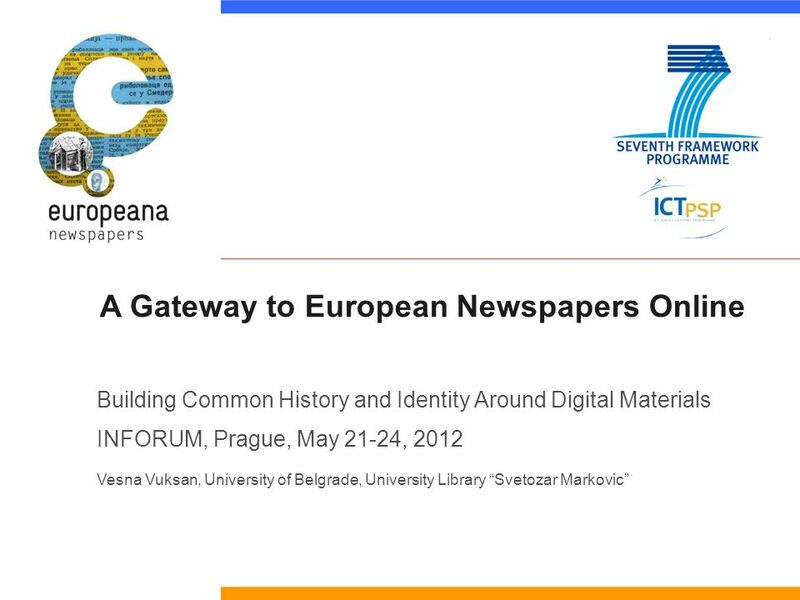 A Gateway to European Newspapers Online Building Common History and Identity Around Digital Materials INFORUM, Prague, May 21-24, 2012 Vesna Vuksan, University. 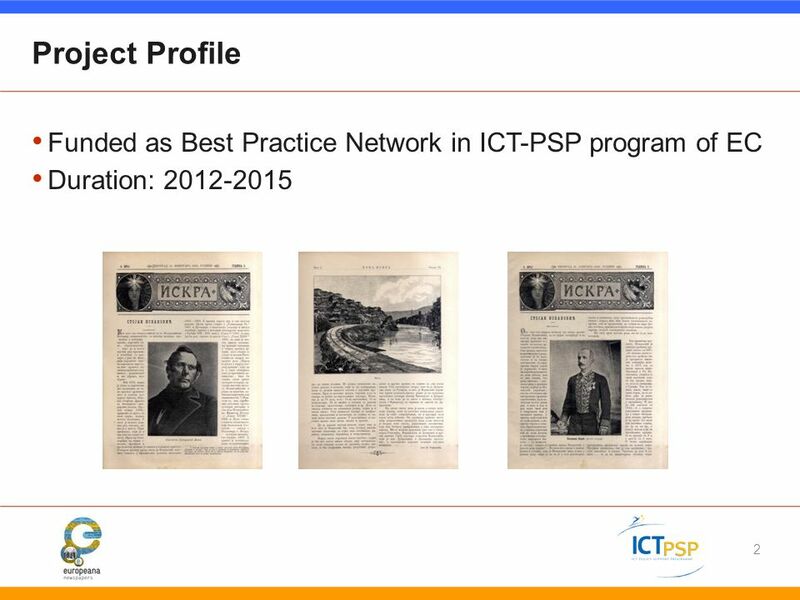 6 6 University Library in Belgrade: Role Involved in all segments of the project Adds 380.000 pages of newspapers published in Serbia before 1941. Librarians from Belgrade will participate in developing EDM and finding new ways to make Europeana content more usable and more used. aims at creating innovative digital objects that will catch attention of users and bring back into focus the quality historical content. 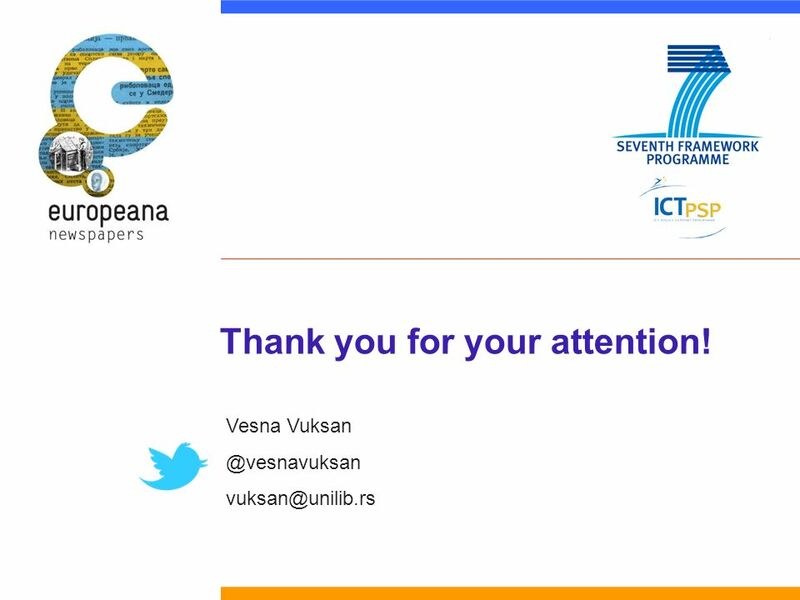 Download ppt "A Gateway to European Newspapers Online Building Common History and Identity Around Digital Materials INFORUM, Prague, May 21-24, 2012 Vesna Vuksan, University." Centres of Competence and Virtual Centres of Excellence APARSEN webinar Hildelies Balk – Pennington de Jongh, 16 october 2012. ICT-PSP Call 5 Digital Content InfoDay, Luxembourg, 8 March 2011: Slide 1 Digital Libraries Activities Directorate E Digital Content & Cognitive Systems. 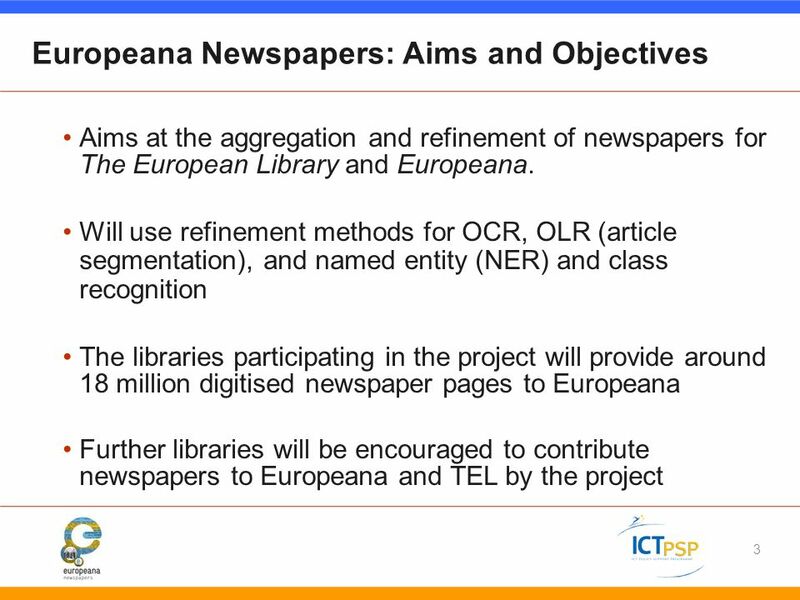 LIBER, Europeana and the Europeana Newspapers Project Dresden, Aleš Pekárek, Association of European Research Libraries, Den Haag, NL. 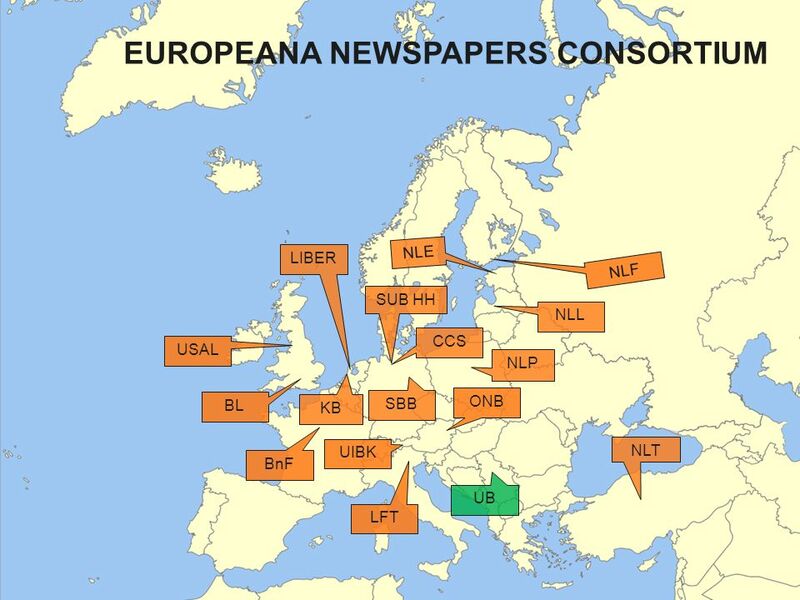 The European(a) Newspapers Project A Gateway to European Newspapers Online Paris, Thorsten Siegmann, Staatsbibliothek zu Berlin, Germany. 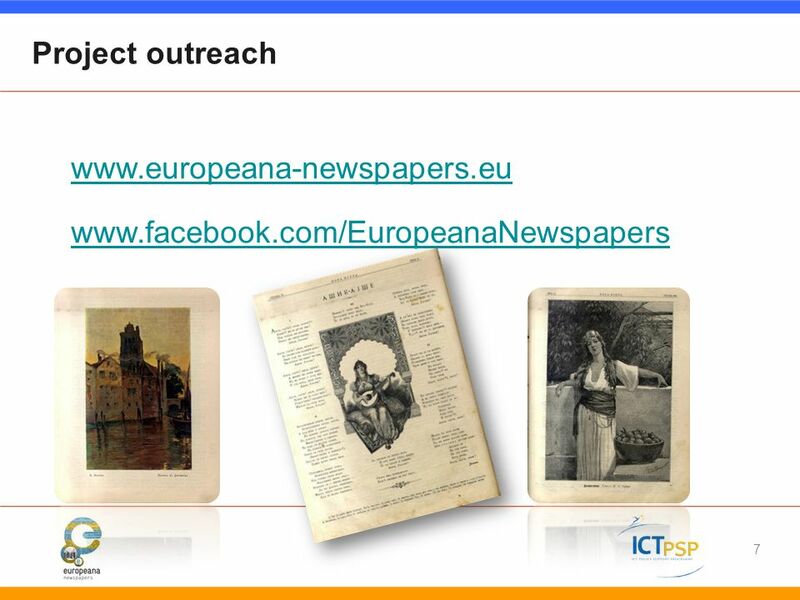 Europeana Newspapers Project A Gateway to European Newspapers Online. A centre of expertise in data curation and preservation LOCKSS Town Meeting :: DCC LOCKSS TSS :: 2 nd December 2005 DCC LOCKSS Technical Support Service. 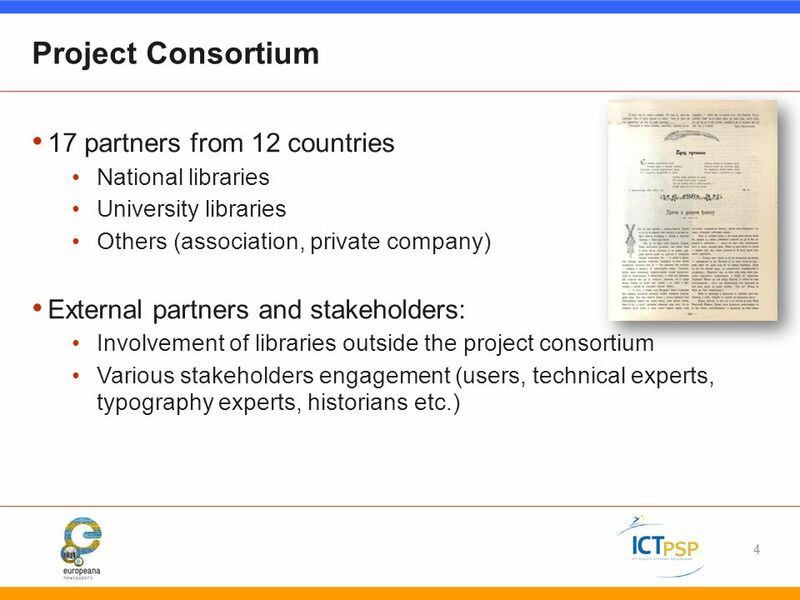 Survey of Research Libraries on Aggregation of Digital Content Kathy Sadler, UCL Plenary Board Meeting Bratislava, 8 May 2010. The Europeana ecosystem and the role of libraries Jill Cousins The Researcher of Tomorrow, Europeana Libraries Final Conference, Madrid, December 4, 2012. Digitisation of Cultural Heritage at the National Library of Latvia: Past and Future Uldis Zariņš Head of Strategic Development National Library of Latvia.